Chinese parents always like to make their children study in foreign schools. They hope their children can study in American or British schools. But it’s not easy for Chinese students to study in the foreign schools. This makes the parents very unhappy. Good news comes to these parents. 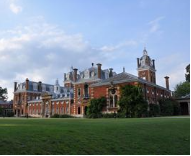 A Chinese company bought a British school this week. The name of the school is Chase Grammar School. It is very famous in Britain. It has 300 students, and 40 students are from China. Now are you ready to go to the school? To study at the school, you need to have a lot of money. If you go to the school in the daytime and go home after school, you need to pay the school ￡11,000 ($16,876) a year. If you study and live in the school, you will have to pay as much as ￡36,600. 1. Chinese parents like to let their ______ study in foreign schools. 2. Chinese parents are ______ that their children can not go to foreign schools easily. 3. How many Chinese students are there in Chase Grammar School? 4. To study in Chase Grammar School, you have to be ______. 5. Which is important in Chinese parents’ eyes?